While the Midwest continues to deal with the aftermath of a snowstorm tying up air travel in states like Illinois, Wisconsin, Minnesota and Iowa, the Bay Area is dealing with its own bit of travel headaches caused by the local weather. Low-hanging, thick clouds stuck around San Francisco International Airport all morning, preventing planes from flying in and out. From 35 to 60 in just a couple hours, the number of cancellations at SFO continued to grow Friday morning into the afternoon. 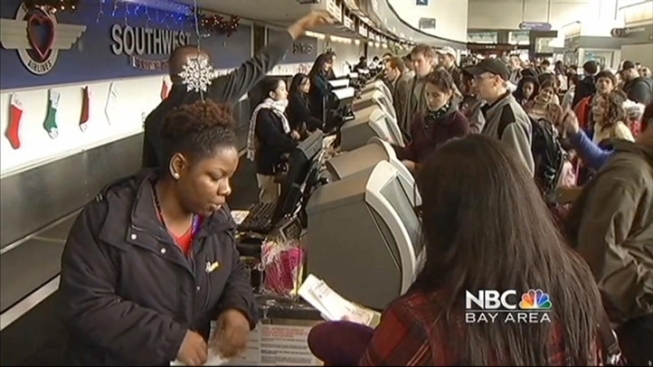 Airports in Oakland and San Jose were pleased to report they each only had one cancelation each. The wet weather pattern is expected to continue into the weekend, but dry up for Christmas Day. Sherri and Gary Jones of Seattle were stuck at SFO on Friday afternoon, unable to get to Los Angeles for a funeral. They were trying to get to the service for Gary Jones' mother, but they received a text their flight had been canceled. On the Friday before Christmas, wet weather on the West Coast and snow on the East Coast forced 60 flight cancellations at SFO. Stephanie Chuang reports. "The viewing is at 6:30 tonight," Sherri Jones said. "I'm feeling like we won't make it. We're not very happy." Mark Stephens of Hayward was dressed in Santa Claus garb, ready for his flight to D.C. with his usual preparations pre-trip. He had a more light-hearted attitude. But he wasn't missing a funeral. The canceled flights spanned from Renoe-Tahoe to Palm Springs, Modesto to Monterey. Meteorologist Christina Loren has your Bay Area weather forecast. 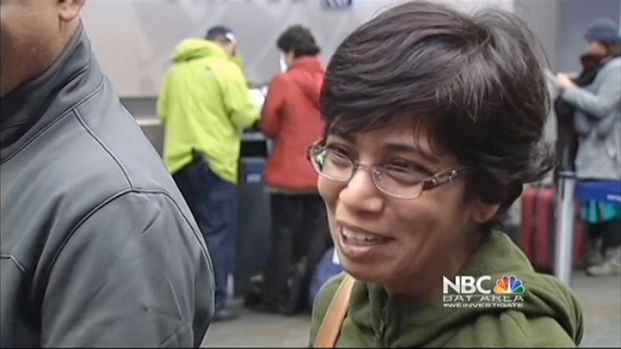 Seema Patel of Berkeley said her United Airlines flight was overbooked, but she made lemonade out of the situation. For Stephens - the one dressed as Santa - it’s just about focusing on what’s important, especially during the holidays. If you're heading out on the roads anywhere over the Bay Area be prepared for plenty of slick conditions the next 72 hours. 3 different waves of energy could produce upwards of 3 inches of rain and elevate isolated flooding concerns for the upcoming Holiday Weekend. Details on how long rain could last from Chief Meteorologist Jeff Ranieri in the full 7 day forecast. NBC Bay Area's Kim Tere contributed to this report.